I love HBO's Boardwalk Empire, about gangsters in Atlantic City during Prohibition. There's something about that era of history that seems glamorous and delicious, even though the reality of it was violent and dark. 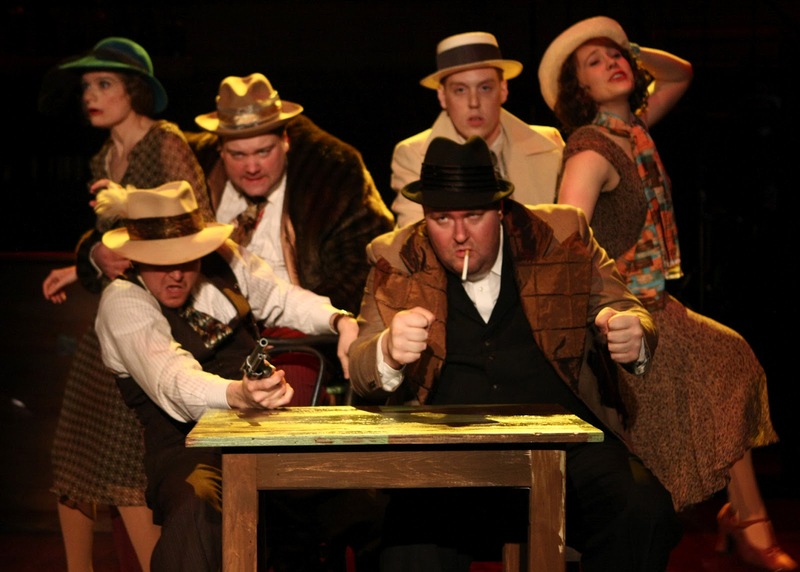 The History Theatre offers a fun and campy look at this era in our very own hometown. Capital Crimes: The St. Paul Gangster Musical* is a little like Boardwalk Empire the musical, without the heavy drama, and with the Depression-era Midwest as the backdrop instead of AC. I almost wish they had gone a little bit further into camp; there were some more serious moments that didn't quite fit the tone of the show. But all-in-all it's a fun show that is sure to make you want to learn more about these criminals and their involvement in Minnesota history. And it's pretty cool to think that some of these things happened just a few blocks from where you're sitting. That's what the History Theatre does best - shed light on the complicated and varied history of our beloved state. 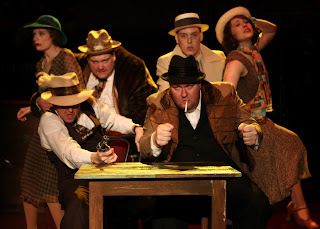 The show tells the true story of Barker-Karpis gang, who were bank robbers, murderers, and kidnappers working throughout the Midwest, including Minnesota, where they kidnapped local beer tycoon William Hamm. This story is told through the eyes of crime reporter Nate Bomberg who acts as narrator (Jake Endres, also playing multiple other roles, much as he did in the last History Theatre show, Coco's Diary). We see the Barker brothers, their mother, and Alvin Karpis as they plan and commit crimes. We also see J. Edgar Hoover and the FBI chase them, in particularly Karpis as Enemy Number One. Get there early for the pre-show entertainment - an onstage speakeasy, complete with dancing, singing, drinking, and fighting. I kept waiting for the dancers to return during or after the show, but sadly they never did. E.J. Subkoviak again plays a government official with questionable motives and techniques. In 1968 he was Nixon's adviser John Mitchell, and here he's Hoover. One of the highlights of the show is his hilarious song "Perfection." This show is at its best when it's tongue-in-cheek, not taking itself too seriously. Josiah Austin Gulden as Karpis looks like a young Nucky Thompson (with better teeth), has a great voice, and makes a compelling hero-criminal. You almost want him to get away with his crimes and retire with his "girl" and start a family. Speaking of, the two gangster girlfriends are played by the clownish (I mean that as a complement) and loose-limbed Kimberly Richardson and the more serious and lovely-voiced Anna Reichert. Paula and Dolores take "stand by your man" to a whole new level. You can definitely see touches of director Noah Bremer of Live Action Set in this show. His theater company excels at physical theater, using their bodies and movement to set the scene and tell the story. There are some really lovely moments of that here, but I found myself wishing for more. I love period costumes, and E. Amy Hill does a beautiful job bringing the 1930s to life without being too over-the-top about it. Wear your long strand of pearls or your fedora and you'll fit right in. 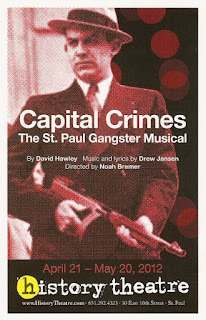 *I received two complementary tickets to attend the opening night of Capital Crimes: The St. Paul Gangster Musical. Hi Melanie. You can find the contact info for the History Theatre here and they might be able to put you in touch with the creators.